Much of the twentieth century was a difficult period for narrative painting – well, for painting as a whole. Although there were still many fine artists who painted superb works, they were viewed as tired and jaded compared to the avant garde of abstract expressionism, colour fields, and the other fads which may become largely forgotten in the fullness of time. Emerging in the last few decades was an understanding that any art form which obsessed with internal self-scrutiny and ignored its public needed rejuvenation. With this came some excellent narrative painting. I will consider just a few examples from three major artists. Whilst it is wonderful that all three are very much alive, this poses problems over copyright and my ability to show images of their paintings here. If you are not clear about those issues, this article goes into more detail. I am delighted that Stuart Pearson Wright has generously provided images of his two paintings, and hope that Paula Rego and Peter Doig may follow suit: if they do I will update their entries here. Christine and Léa Papin were two maids, born locally, who worked for a family living in Le Mans, France. Quiet and retiring, one day it was discovered that they had murdered the wife and daughter of the family. The women’s bodies were discovered beaten and mutilated, and the two maids admitted their crime. There was extensive psychological speculation as to the motives for the murders. Although the French playwright Jean Genet wrote Les Bonnes (The Maids) (1947) with a plot remarkably similar to those murders, he denied basing his play on their story. Genet portrays his maids as engaging in sado-masochistic rituals when their mistress is away, leading to the climax of ceremonially killing her. Rego sets her painting inside a lady’s dressing room, with a simple pink dressing table at the left, two chairs, and a low round table at the right. Further to the right of the low table, at the right edge, the door of a wardrobe is ajar; hanging on the inside of the door is a grey towelling dressing gown or bathrobe. Arranged in this room are four people, in pairs. Sat in front of the dressing table is a white short-haired person who could be a hirsute woman or a man, as evidenced by a faint moustache. They are wearing a close-fitting checked jacket and dark green above-knee skirt, with nylons or tights, and medium-height women’s dark high-heel shoes. Their head is bent down, eyes closed, and they are holding their hands together on their lap. Behind that person is a darker woman dressed in maid’s uniform, with long black hair tied back. She has a small white collar, her uniform dress is plain black, and she wears a pale pink pinafore over it. Her eyes are closed, her lips pursed, and her expression tensed but otherwise neutral. Her right hand is held at the back of the head and nape of the neck of the person at the dressing table, and her left hand rests at the top of her own left hip. Her feet are wide apart, and she is wearing dark low-heeled working shoes. Behind that maid, sat on a higher chair, is a white younger woman, wearing a short-sleeved red blouse and full mid-brown skirt. She is facing away, her face buried against the chest of another maid. The young woman’s arms and hands are held out and up as if in surrender, and she has thick blonde hair which is tied back. The second maid stands in front of the younger woman. She is wearing a maid’s uniform, with a white fabric tiara, white collar, dark green dress, and a white pinafore. Her eyes are closed, and her chin rests on the young woman’s blonde hair. Her facial expression appears neutral. Her left hand holds the young woman’s right wrist, and her right hand grasps the young woman’s left side just below the armpit. The dressing table has a rectangular mirror, a table-lamp and shade, and three small items typical of such a table. The low table has an open book and a long-handled dusting mop. In the foreground at the left edge are two small brown cases. At the right edge of the foreground is a small boar, its mouth open and revealing teeth. There are mid-blue drapes at the left, behind the dressing table, and above a distant wardrobe at the right. There are also odd shadows suggestive of a tree, which are cast on the wall midway between the two maids. Knowing the reference to Genet’s play (or the original murders) allows the viewer to associate the cues in the painting with the original narrative. The person at the dressing table will then be identified as the murdered wife, and the younger woman as the daughter. Facial expressions do not appear particularly helpful, and body language seems to establish a strangeness which could be a precursor to darker events. However, the scene is timed well before the maids became violent, and plays on uncertainty and menace to lead the viewer in to later events. The fairy tale of Snow White is familiar throughout Europe, and Rego has made a series of paintings showing different episodes within it. Snow White’s mother, the Good Queen, dies and Snow White’s stepmother turns out to be evil and vain. The stepmother orders a huntsman to take Snow White out into the forest and kill her, but instead he abandons her to fate. She finds the cottage of the seven dwarves, who look after her. The wicked stepmother discovers that Snow White is still alive, and tries to kill her with a poisoned comb, which fails. The stepmother then makes a poisoned apple, which she tricks Snow White into eating. She is put into suspended animation, but the dwarves assume that she is dead, and put her in a glass coffin. She is awakened by a prince, who invites the wicked stepmother to their wedding. The stepmother is forced to step into red-hot iron shoes and dance until she drops dead. A simplified version of this narrative was used in the Walt Disney animated movie Snow White and the Seven Dwarfs (1937), which is the basis for Rego’s series of paintings. These apparently centre on underlying sexual rivalry between the wicked stepmother and Snow White. A middle-aged woman, dressed in Disney Snow White clothes, lies collapsed, her legs still on a large dark brown armchair, her back and head sprawled on the floor. Her face (which is almost upside down to the viewer) has a furrowed brow and an agonised expression, with swelling inside her right cheek as if her mouth still contained food (the poisoned apple). Her right hand clutches the base of her neck, her left hand grasps her skirt behind the left thigh. Her feet face up, the left crossed behind her right knee. The toes on her right foot are tensed in a rictus. Her hair is dark brown, with a fine scarlet ribbon. The armchair is old and worn. Over its left arm is a small filled quilt covered with fabric with a pink rose decoration. The back of the chair has an animal fur rug draped over it. Rego uses a character more widely recognisable, perhaps even a stereotype derived from the movie. She follows Alberti’s rules methodically, with the expected facial expression and body language indicative that Snow White has just eaten the poisoned apple, and has now collapsed in the state of suspended animation. The recasting of Snow White from Disney’s pure and innocent young woman to Rego’s middle-aged woman with worn feet and slightly hairy legs results in an incongruity, and strangeness, which appears to be part of Rego’s revised narrative. It has been suggested that this reflects on sexuality, and the ageing of women, although the painting itself does not give direct cues to that. Bradley F (2002) Paula Rego, Tate Publishing. ISBN 978 1 85437 388 5. The movie Friday the 13th (1980) is a cult ‘slasher’ horror film in which a group of teenagers, who are trying to re-open an abandoned campground, are murdered one by one. In the climax of the movie, one of the teenagers, Alice, is pursued by the malevolent Mrs Voorhees. The two engage in a violent fight, which ends with Alice decapitating Mrs Voohees with a machete. Alice then boards an open canoe and floats to the middle of a lake. The police arrive on the bank, at which time the decomposing body of another of the teenagers starts to attack Alice in the canoe. Alice is dragged under the water, only to awaken in hospital, having been rescued by the police from the lake. Peter Doig (b 1959), Echo Lake (1998), oil on canvas, 230.5 x 360.5 cm, The Tate Gallery, London. Image at the Tate Gallery. Peter Doig’s panoramic canvas shows the scene from Alice’s viewpoint in the canoe, at night. The lower half of the canvas is the surface of the lake, which is mirror-like and reflects the bank and sky behind. Prominent on that bank, just to the right of the centre, is a policeman, both hands apparently cupped at the side of his face as if he is calling out. He stands right at the edge of the water, looking directly towards the viewer, wearing a white shirt with dark tie, and black trousers. Behind him, and in the midline of the painting, is his patrol car, headlights still lit, where he parked it, on the bank. At the left is a streetlight (or other pole) which floods the strip of bank with light. Behind that are dark trees, distant lights of buildings. The trees rise until meeting the black sky. At the right there are some trees lit in eerie and twisted shapes. There is no facial expression, and only very limited body language. Anyone knowing the movie is likely to recognise its cues to the climax, but otherwise they would be very hard to decipher. The composition, content, and colours all evoke a dark strangeness and sense of foreboding. Something sinister seems to be happening, but it is not clear what (apart from the movie references). This painting is based on still images from the same movie. Peter Doig (b 1959), Canoe-Lake (1997-8), oil on linen, 200 x 300 cm, Private collection. Image at The Saatchi Gallery. This painting appears to show the view of the policeman in the previous work. Crossing the centre of the painting, and almost as broad as it, is a green open canoe containing an apparently collapsed woman, who is green and yellow in the eerie light. Her right arm hands over the side of the canoe, the hand touching the water and causing circles of ripples. She is slumped forward, only her head and right shoulder visible within the canoe. Her eyes are black points, staring. The flat mirror-like surface of the lake fills most of the middle half of the painting in a horizontal band. Its surface is yellow and pale green. Behind is the edge of the lake, with dense trees, and a hut almost hidden by them. The trees at the edge of the lake are lit brightly in the same yellow-green light. The lower band (less than a quarter) of the painting is black, apparently of fence palings closest to the viewer. With almost no evidence of facial expression and limited body language, the cues provided only make sense in the context of a knowledge of the source movie. Otherwise the painting evokes a similar sense of numb forboding and horror. Searle A, Scott K, Grenier C (2007) Peter Doig, Phaidon Press. ISBN 978 0 7148 4504 3. Doig P et al. (2013) No Foreign Lands, Hatje Cantz. ISBN 978 3 7757 3723 4. The movie An American Werewolf in London (1981) tells the comedy horror story of two young American men who are on a backpacking holiday in England, when they are attacked by a werewolf (or lycanthrope, part man and part wolf). One of them dies, the other, David, is taken to a London hospital, where he has visions of his dead friend who tells him that he (David) is a werewolf and will transform with the next full moon. When David leaves hospital he stays with a pretty young nurse from the hospital, in her London flat, and makes love to her. His dead friend appears to him again, warning that his transformation is imminent, and David later becomes a werewolf and kills half a dozen people in London. David attempts to get himself arrested, then to cut his wrists, but he transforms again and starts killing people. He is eventually cornered by police, and his girlfriend tells him that she still loves him. When he lunges forward, he is shot, and dies in human form in front of his grieving girlfriend. It is night, lit starkly by a full moon which has risen high, directly in front of the viewer. An old stony track runs through a barren leafless wood, from the foreground to the centre background, where it transforms into a small waterfall pouring into a stream. The trees are old, gnarled, and twisted, in places writhing across the breadth of the track. In the right foreground, at the edge of the track, is a werewolf, balancing on a small rock. Its jaws are open, showing its teeth, and it is sexually aroused. It holds out its front legs (arms) as if to grasp with its claws. On the opposite edge of the track, also poised on a rock, is a naked and buxom young woman with dark shoulder-length hair. Her mouth is wide open as if she is screaming, but her face shows a mixed expression of fear and lust. 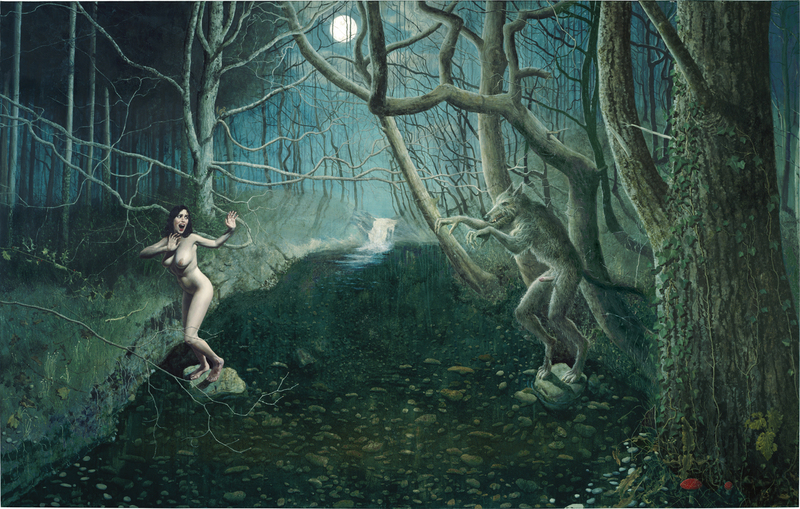 She appears to be running away, to the left edge of the painting, but her head is turned towards the werewolf, her shoulders rotated to her left, and her arms and hands are held out as if to fend the werewolf off. This painting was inspired by the movie An American Werewolf in London, and an episode in the artist’s life in which he was with a girlfriend exploring the countryside, and stumbled across young lambs which had been killed by predators in a wood. This discovery coincided with a sexual awakening, which he felt was represented by the combination of wolf and man in the werewolf. He intended “to explore that uncharted place where the mystery and sublime of the romantic landscape meets the high camp and melodrama of Hammer horror.” This is the first in a proposed four-part narrative. Although the artist does not mention it, there are some similarities in treatment with the paintings of Paul Delvaux (1897-1994); unfortunately as they are still in copyright, they are also hard to find online. Wright follows Alberti in full, using facial expression and body language to great effect. Although the specific reference to that movie may be obscure to many viewers, the werewolf is easily recognised, and cues other similar narratives and ideas. This painting therefore has obvious and clear narrative which is eloquently expressed. The Yellow Rose of Texas of the title is almost certainly a reference to the traditional folk song, although there was also a movie and a legend of the same name. The song tells the desire of an African-American singer (who refers to himself as “darkey”) to return to a “yellow girl”, who was born of African-American and white parents, and is thus bi-racial. The lyrics have been changed more recently to replace the racially-specific references. This song became popular with Confederate soldiers in the Texas Brigade of the American Civil War, and in 1864 was used as that army’s marching song. Wright’s painting shows a white man (who may be a self-portrait?) wearing ‘country’ clothing, apparently singing and playing an acoustic guitar; behind him is a white woman with black hair in ‘western’ clothing, also singing. They are in the left foreground. Behind them a rough track leads past a crude hut on a hillside. Above the hut is a dense evergreen forest. Behind the singers and on the left is a mixed forest. In the distance is a very high, rocky mountain which is covered with snow and ice. The singers’ faces express only the act of singing. The woman holds the shoulders of the man in front of her. Otherwise there is no body language. Initially it might appear that this painting could have had some deeper narrative, perhaps relating to the feelings expressed in the song, or to its original racial setting. 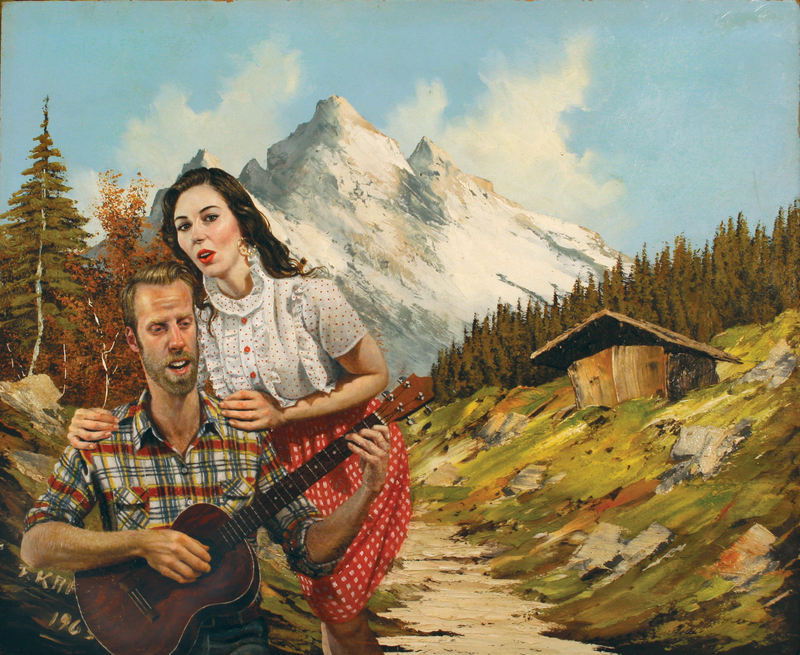 However the two figures are clearly not intended to be the characters in the song, and the landscape background is not that of Texas: the mountains shown must be in the Rockies, thus far from Texas. Instead it appears to be a painting about the ‘country and western’ singing of traditional American folk songs, perhaps also evocative of the artist’s romantic relationship at the time. This is narrative in itself, but quite a different story. Stuart Pearson Wright’s website is here.I am extremely grateful to the artist for so generously providing the above images, and ask that you respect his copyright. Not only is narrative painting alive and flourishing, but at least some of those who practise it now use Alberti’s rules and other proven techniques to convey powerful stories. The most obvious difference from narrative painting prior to 1860 are the references. These are no longer to classical myths, religion, or the printed word more generally, but predominantly to movies. In some ways this may appear more limiting, because of the rich visual content of source movies (as against texts of the past). However, these three artists, and many others, have shown us their own visual readings of their sources, which often contain additional narrative material. In little more than a century, narrative painting has been transformed from the moribund and shunned, to the innovative and exciting. Godfrey T (2009) Painting Today, Phaidon Press. ISBN 978 0 7148 4631 6. Posted in General, Painting and tagged Delvaux, Disney, Doig, Genet, horror, movies, narrative, painting, Rego, Snow White, Wright. Bookmark the permalink. I have updated this on 15 February to include images of Stuart Pearson Wright’s paintings, which he has generously provided for this purpose. They are absolutely wonderful, and their improved detail has helped me improve my descriptions above.